Climate change affects the social and environmental determinants of health such as clean air, sufficient food, safe drinking water and secure shelter, and may be considered a threat to health. Healthcare professionals have been called to take action on carbon reduction. Action depends on various factors such as personal commitment to environmental issues and professionals’ understanding of climate change, and action may occur at individual, organisational, community, national and international levels. 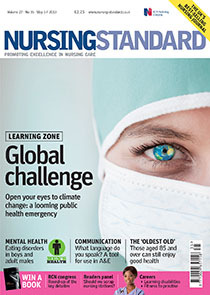 As public health is a core component of the nurse’s role, this article discusses the health effects of climate change and suggests ways to address these effects.